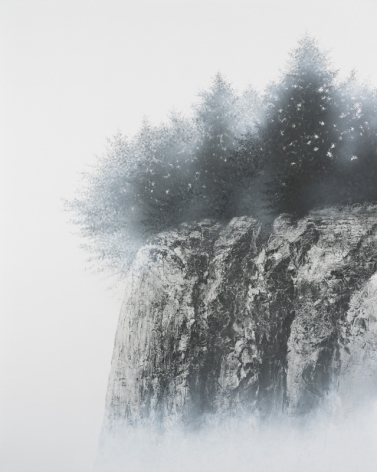 Work by gallery artist Hiroshi Senju, including new cliff paintings from At World's End, a large exhibition of ethereal, abstracted landscapes on view at Sundaram Tagore Chelsea through January 13, 2018. 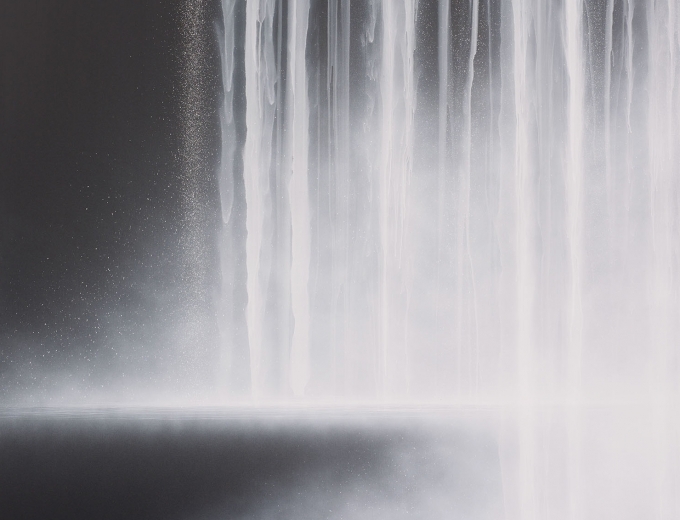 Celebrated Japanese artist Hiroshi Senju is noted worldwide for his sublime waterfall and cliff images, Senju mixes traditional Japanese materials and Western visual language. 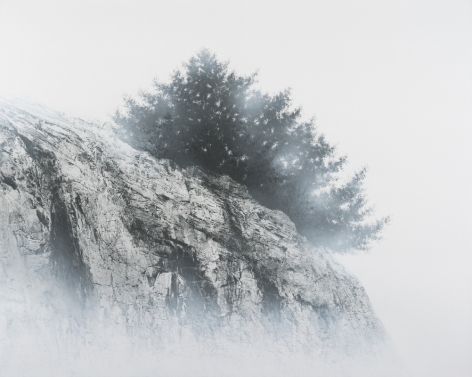 For this show, the artist explores ethereal, abstracted landscapes. This exhibition caps an eventful year for the artist: His work is currently on view at the Los Angeles County Museum of Art and was prominently featured in the Japanese gallery at The Metropolitan Museum of Art this past spring. He was also honored with the Isamu Noguchi Award and a large public commission to produce forty-two folding screens for the Kongōbu-ji Buddhist temple at Mount Koya in Japan. 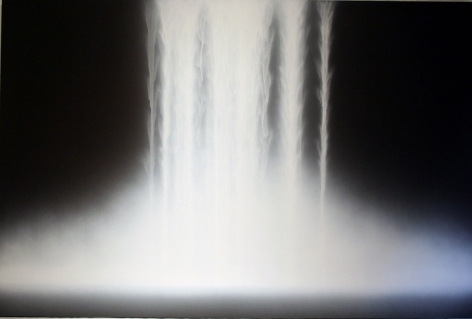 Hiroshi Senju is widely recognized as one of the few contemporary masters of the thousand-year-old nihonga style of painting. It is an art form that emphasizes the use of traditional Japanese materials, such as paints made from ground stone, shells and corals suspended in animal-hide binder and washi paper, a fibrous material known for its ability to resist warping or tearing, even when damp. Senju began exploring the cliff image in 2007, inspired, in part, by a piece of washi left crumpled on the studio floor. Reaching to pick it up, the artist looked more closely and was struck by the rock-like texture that formed in the creases. Two years later, Senju’s first fully realized cliffs debuted in a solo show at Sundaram Tagore Hong Kong (Out of Nature: Cliffs and Falling Water, 2009). To produce his cliff paintings, Senju uses tools and materials carefully sourced and customized over the years. He favors a mulberry washi paper from a master papermaker in Echizen, Japan, which can only be produced in winter. His brushes are made by hand, each with a designated function. Lacquered bamboo or wood handles are topped with horse, fox, sable, weasel or raccoon bristles. Senju begins by creasing the paper by hand. This unique process is physical and spontaneous, but it also requires skill and intention. The structure of the paper and its subtle folds inspire the composition of the landscape. Senju then applies natural pigments, carefully allowing delicate rivulets of paint to move across the surface. “Using acrylic pigments, I can express a contemporary, near-futuristic atmosphere, producing brand-new images,” says the artist, “while the use of traditional pigments creates a more classical atmosphere.” The fusion of these pigments—one ancient, derived from nature, and the other modern, made by human hands—results in intricately rendered images that evoke the subtle passage of time and allude to the Japanese notion of finding beauty in what is transitory. Senju spent more than two years creating the works in this exhibition, which enabled him to produce paintings in a wide range of sizes. The majority measure from 26 x 32 inches up to 90 x 72 inches—with a few sweeping exceptions, including an immersive, panoramic folding screen that spans more than 12 feet. Hiroshi Senju was the first Asian artist to receive an Honorable Mention Award at the Venice Biennale (1995), and has participated in numerous exhibitions including the Beauty Project (1996) at the Museum of Contemporary Art, London; The New Way of Tea, curated by Alexandra Munroe, at the Japan Society and the Asia Society in New York (2002); Paintings on Fusuma at the Tokyo National Museum (2003); and Frontiers Reimagined, a Collateral Event of the Venice Biennale (2015). He was recently awarded the Foreign Minister’s Commendation from the Japanese government for contributions to art. Senju’s work is in The Metropolitan Museum of Art and Brooklyn Museum, New York; the Los Angeles County Museum of Art and the Museum of Contemporary Art, Los Angeles; the Asian Art Museum, San Francisco; the Nelson-Atkins Museum of Art, Kansas City, Missouri; the Royal Ontario Museum, Toronto; the Museum of Modern Art, Toyama, Japan; the Yamatane Museum of Art, Tokyo; Tokyo University of the Arts; and the Kushiro Art Museum, Hokkaido. The Hiroshi Senju Museum Karuizawa in Japan opened in 2011. Public installations include seventy-seven murals at Juko-in, a sub-temple of Daitoku-ji, a Zen Buddhist temple in Japan, and a large waterfall at Haneda Airport International Passenger Terminal in Tokyo. The Benesse Art Site of Naoshima Island also houses two large-scale installations. 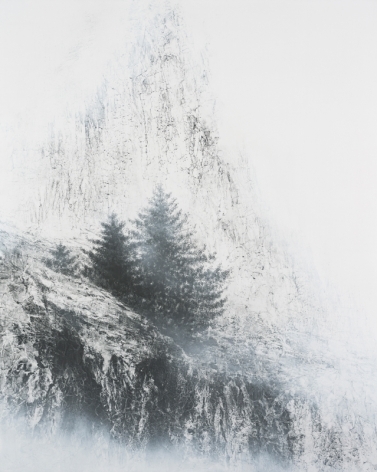 In 2009, Skira Editore published a monograph of his work titled Hiroshi Senju. As part of a project commemorating the 1,200th anniversary of Kongōbu-ji temple at Mount Koya, Senju has been commissioned to produce a series of fusuma. The project is slated for completion in 2018. Accompanying this exhibition is a forty-eight–page catalogue with an essay by Akiko Miki, international artistic director of Benesse Art Site Naoshima and co-director (artistic) for the Yokohama Triennale 2017. She is also former chief and senior curator at Palais de Tokyo, Paris.